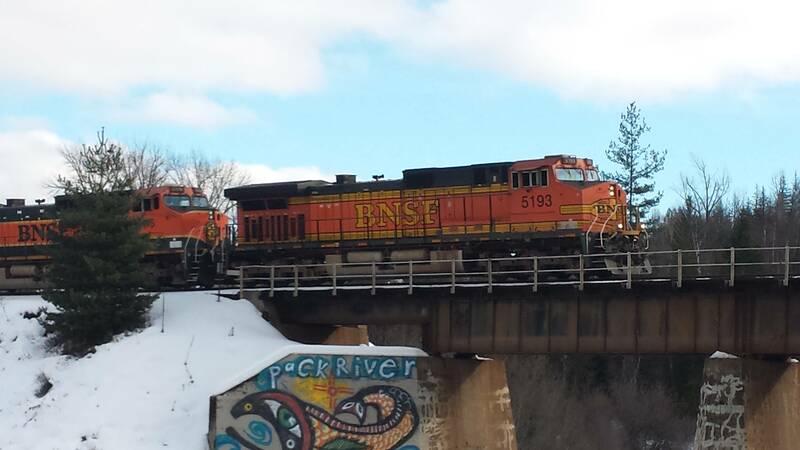 North Idaho is a main funnel for trains coming from and heading to Canada. We have plenty and since moving here I have become facinated with them. The shear power, strength of these brutes just amazes me. Their beauty as they move through the different landscapes. Weather extremes only seems to enhance them. Like a magnet one is drawn to them. Or perhaps it is just me. Most trains coming through are 100 cars or more. Imagine! This short video (23 seconds) shows a train starting again after having waited on another to pass. The domino type sound rushing from car to car as the couplings grab. Keep in mind the engine for this train is up around to the left beyond the buildings. The power and strength amazing! These cars were empty thus the hollow sound. The same effect when full only a very heavy thunk, thunk, thunk with no less speed.